for all people of Batam, we opened earlier operating hours of 12 o'clock in the afternoon, "said Bram, Manager Thrive Billiards & Futsal Center. 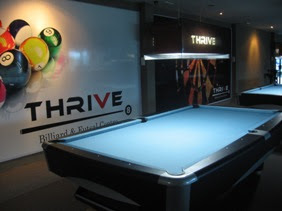 Thrive Billiards & Futsal Center is located at Jalan Yos Sudarso, side Pom Baloi gasoline pool is also impose packages at happy hour from 12:00 to 19:00 pm. With only Rp 100 ribu, players can enjoy the facilities Billiard Thrive with free soft drinks from Monday to Sunday. If it does not take Packages Happy Hour, tariffs for daytime Thrive provides cheaper rates Rp 28 ribu. Whereas for the night at 07.00-02 night Rp 33 Ribu. For the member will be given 10 percent discount. Happy hour applies to areas of the hall with 12 tables facility, in addition to that there is room plus 1 VIP room with karaoke and darts games, there are three billiard room Lago, where all equipped with free hotspots. "We offer a package of individual and corporate, are also special prices for students and college students. Selangkapnya can visit Thrive, "said Bram. Players are also offered following the weekly event with registration of Rp 30 Ribu with the first prize winner Rp 700 Ribu, then, Rp 400 Ribu, Rp 200 Ribu and Rp 100 Ribu. Not only can enjoy billiards facilities for soccer enthusiasts in the room aka futsal, Thrive also provide special pricing to students who only Rp 80 Ribu / hour at 08.00-17.00 o'clock. For general Rp 100 Ribu per hour.